ROBERT MARTIN is a Grammy nominated composer. In New York, on January 11, 2015, the North/South Consonance presented a retrospective concert of his music spanning four decades, in recognition of his musical achievements and large body of highly original work. Subsequently, they recorded it in the legendary Avatar studios. Robert Martin began composing at age 10. He earned his Bachelor’s and Master’s degrees in Music Composition from the Peabody Conservatory of Music. Soon after, he was awarded the Charles Ives Scholarship for outstanding music composition from the American Academy of Arts and Letters and a Fulbright Scholarship, which allowed him to pursue post-graduate studies in New York and Vienna. From there he traveled throughout the Eastern Bloc of Europe, meeting many composers. He was the 1999 recipient of the Japan-U.S. Creative Artist Fellowship in music composition. Robert Martin’s music is often described as fresh and visionary, but at the same time it is approachable in a way that welcomes the newcomer. And it is always deeply indebted to the greatest traditions of the past. The Theodore Presser Company has published over 100 of his pieces. His music has been performed by many of the finest musicians in New York, and is recorded on the North/South Recordings, Furious Artisans, and CRI record labels. for 10 Players 12:00 Fl. Ob. Cl. Hn. Bsn. 2Vln, Vla. Vcl. Cb. “Antares” is simply an extraordinary piece of music. Martin masterfully uses repeated motivic patterns to bind the piece into true musical poetry. While the piece lacks a tonal center, the sensible structure creates a wonderful sense of balance and symmetry. Though challenging, the work is accessible to the advanced undergraduate student. Belonging to a series of duets for various instruments, these works are free and imaginative in rhythm, harmony, and thematic design. The multi-voicing possibilities of the bassoon were presented, sometimes in an apparent manner, sometimes hidden, but always subtly manipulated… Beautifully articulated details form a vignette, surrounded and supported by the carefully chosen tones of this composition – it’s a very strong work. …the pieces are admirably guitar friendly, offering plenty of room for rich, sonorous interpretation… The performance notes suggest the volume need not always be performed in its entirety. A practical suggestion… though I feel a complete rendition would be far more successful, the quiet thoughtfulness of many of the pieces surely being lessened in isolation. …a series of short pieces, diverse in character and mood, after the initial solo pieces, the duos sounded quite full, after which the trios seemed like a large ensemble… The pieces are quite fascinating. The title of the work is taken from that of a painting by Arshile Gorky, but Martin’s interest was apparently not so much in the subject matter of that particular picture as in the general notion of what gives an abstract image wholeness and presence. How can the [guitarist’s] speaking hand be felt to have said something meaningful, to have said it completely, and to have said nothing redundant along the way? Here are thirty-six answers to that question. And Robert Martin’s “Emerson Songs” – delicate, to my ears somewhat Asian-influenced – were the favorite of many in the audience. 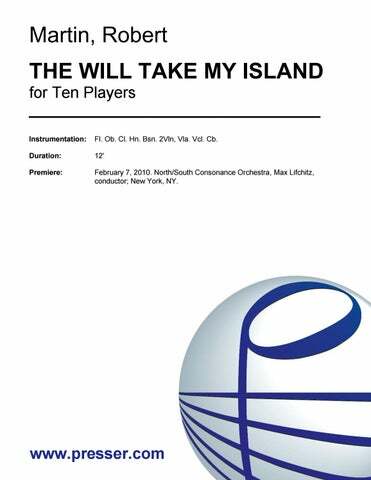 The [“Nine Stellar Pieces”] are not overt showpieces, but the massive challenge to the technical skill of the performer cannot go unnoticed by the listener… Nowhere do I detect any particular influences at work, the score coming from a personal musical voice that has an instinctive relationship with each of the instruments used. …an extraordinary composition …it keeps catapulting you forward in a great monograph of energy of our time. “Vega”…is the first star of Lyra, the lyre of Orpheus and Apollo, inventors of music. Early civilizations…saw this constellation as an eagle or vulture, and the piece seems to accept both connotations. Most of it is eloquent melody, and most of it is in flight.